This California yard features low maintenance, yet lively plants.Shades of Green Landscape Architecture in Sausalito, CA. Low maintenance landscapes must be planned ahead of time. Many homeowners make the mistake of piecing their yard together here and there. 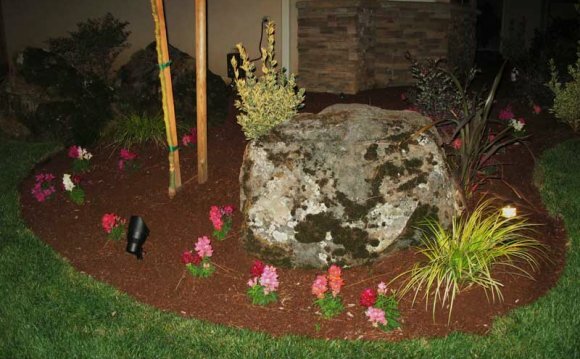 This typically creates a landscape that requires more time and money to maintain than was anticipated. The best way to avoid this problem is to hire a professional landscape designer or architect to plan out your garden with reduced maintenance in mind. Simplicity of DesignLandscaping experts agree that a simple design is the key to a low maintenance landscape. Christopher Starbuck, an Associate Professor for the Division of Plant Sciences at the University of Missouri Extension, says, "Simplicity is characteristic both of good design and low-maintenance landscapes. Eliminate frills such as statues and water features, or design them for easy care and maintenance." Let the landscaping professional that you choose to work with know up front that you would like a simple, low-maintenance landscape. Low Maintenance PlantingAccording to Robert F. Brzuszek, an Assistant Extension Professor for The Department of Landscape Architecture at Mississippi State University, a low maintenance landscape must have the right size plant in the right place. If your designer keeps this in mind it will help you avoid constant pruning. Brzuszek also recommends planting in masses because plants are easier to care for and mow around when grouped. For the most success, mass plants with similar light, water and care needs. MulchingSkip Richter, the director of the Travis County AgriLife Extension (Texas A&M), recommends mulching as a way to reduce landscape maintenance needs.